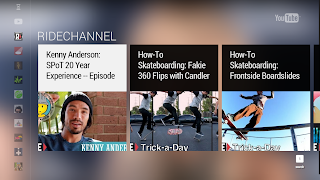 you can find your way around YouTube faster on your mobile device than on your TV. That’s why we launched a feature making it easy to send videos from your mobile to your TV with just one button. This year at the Consumer Electronics Show (CES), we’re bringing that mobile/TV pairing feature to devices from our friends including Bang & Olufsen, LG, Panasonic and Sony. In 2013, you’ll see this feature come to even more devices like those from Philips, Samsung, Sharp, Toshiba, Vizio, Western Digital and others. These new devices will also have the latest look and feel for YouTube on TV, letting you watch HD videos and channels on the big screen with everyone at home. Catch the latest videos from your subscriptions, watch playlists full of 1080p videos and find the next great video faster with search suggestions. Whether you’re at CES or at home, you can now watch YouTube on 400 million devices: from tablets to TVs, smartphones to streaming boxes, and consoles to cable providers. When you sign in and subscribe on any of these devices, you’ll always have something great to watch next. We bet you a billion views you can find your way around YouTube faster on your mobile device than on your TV. That’s why we launched a feature making it easy to send videos from your mobile to your TV with just one button. Is there a way﻿ to set this up for PCs hooked up to TVs? I recall there used to be a separate YouTube Remote app, which included that sort of functionality. Is that included in this update?